Hundreds of people attended the Ebenezer Baptist Church annual pre-Christmas dinner on Wednesday, December 22, 2010 in the City of Newburgh. 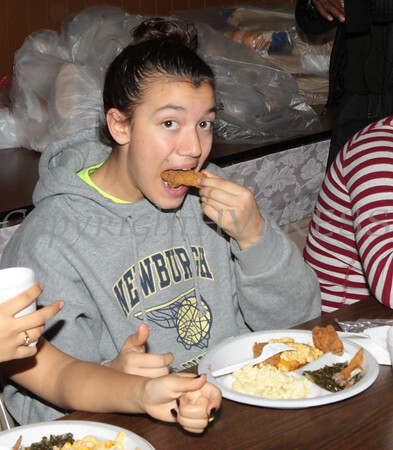 Volunteer Joselyn DeWitt enjoys the Fried Chicken, Collard Greens, Mac n Cheese, Potato Salad and Red Velvet Caket that was served at the Ebenezer Soup Kitchen on Wednesday, December 22, 2010 in the City of Newburgh. Hudson Valley Press/CHUCK STEWART, JR.